When considering a TV setup and installation service, there are a number of factors that can influence the price that you pay. Today we’re talking about five of those factors and why you shouldn’t always go for the cheapest TV setup and installation service in your neighborhood. One of the biggest factors that influences the cost of your TV setup and installation service is where you are geographically located. Like any other service, how much you pay is dependent upon the state as well as the city where you live. For example, a TV installation project in Los Angeles is going to cost much more than a TV installation in Dunedin, Florida simply by virtue of the overall cost of living in each area. When it comes to states and areas of the country, the same thing is true. For example, a TV installation project in Idaho is going to cost less than a TV installation project in California. Yes, we know that this is the same as number one, but this time we’re talking about the location of your TV installation! Do you want your TV installed on the living room wall or are you looking for something a little more complex like above your fireplace? 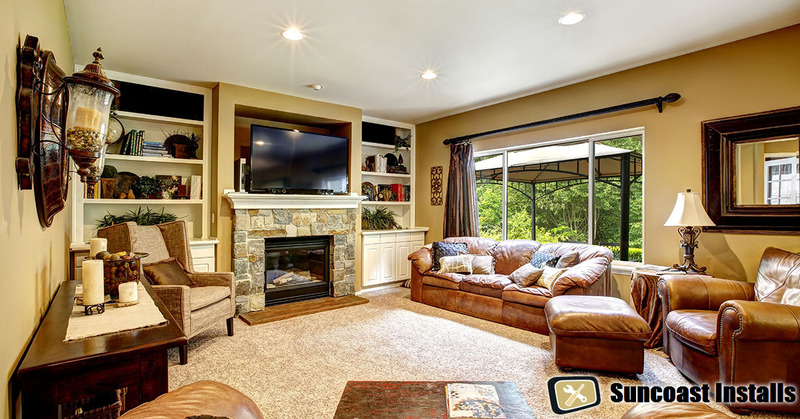 The location of your TV install project varies in the amount of time it takes and the difficulty of the job depending on where that TV is going to be mounted. Different mounting surfaces also have differing degrees of difficulty, for example, it’s much complex to mount a television to a stucco or brick surface than it is to mount a television to a drywall surface. Another factor that influences how much you will pay for your TV setup and installation service is dependent upon the company that you choose. While it is not always the case, companies with little experience or a negative reputation are going to be willing to accept lower payments for their services. Conversely, a company that has years of experience and one that is known for their great quality of service is likely going to cost a little more. Take it from us, though, you always want to go with a TV installation company that has a positive reputation! When it comes to your TV installation you never want to take a chance on a company that has negative reviews because it could not only destroy or damage your television, but it could also wind up tearing down your wall! The size of the TV that you want installed or setup is another factor that plays into the cost of services. You may wonder why it costs more to have larger TV’s installed than it does to have smaller TV’s installed. Many people believe that the installation process for televisions is the same regardless of the size of the television, but this isn’t always the case. If, for example, you are interested in having your television mounted on your living room wall, there are various points of the install that differ based on the size of your TV. For example, the type of hardware required for your TV to be mounted is going to differ and cost more if you have a larger TV that requires more heavy duty hardware to secure it to the wall. Additionally, larger screen televisions may also require additional reinforcement of the wall to support the size and weight of the TV. Not all TV setup and installation service providers offer discounts and coupons on their services, but it’s always worth asking! Here at Suncoast Installs we often run specials and coupons on our TV mounting, setup, and installation services. You may also find that even if an installation company does not usually offer discounts and coupons, that you can still get a custom discount when you have more than one television installed during the same installation appointment! Looking for a TV Setup and Installation Service? If you are looking for a TV setup and installation service in West Florida, Suncoast Installs can help! To make an appointment with one of our skilled technicians give us a call today at 727-480-8358!